We tried this the other night - it was so much fun and so quick and easy! How easy is this? Homemade Ice Cream…In a Bag! Great for any kid, no matter what your age! Put first 3 ingredients in the smaller zip lock bag, and seal bag (make sure it is tightly closed!) 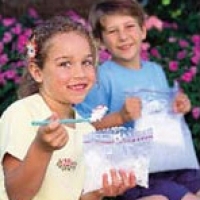 put ice and rock salt in the larger bag, then add the filled small bag, seal the large bag. You don’t even need a bowl! Optional, add mix-ins, and eat the ice cream right out of the bag. Easy cleanup too! You can freeze leftovers if there is any! Kudos for sharing a great idea. Can't wait to try it. What a clever way to make this treat no special machine or bulky equipment. Thanks for this recipe. I'm a teacher and have seen where another class had made this. I'll bookmark it for future reference. I don't have to buy a machine after all! Fun and occupies the kids for a while. I don't know much about making ice cream. I guess the constant mixing motion is necessary? As I was clicking on this recipe, I was having delusions of squishing ingredients in a bag for 30 seconds, then throwing it into the freezer over night. No such luck, eh? I have this recipe in the camping group. Cooooool! OMG... I have to do this with the Grandkids.. the little demons love ice cream... I have done it in coffee cans.. before they changed the shape.. one big can... one little can... roll back and forth on floor..
You can try whole milk I guess...and the *rock salt* holds the *cold* and *regular salt* will not do. sounds yum! can I use milk instead of half and alf? is it possible to use regular salt? Cool! I don't have an ice cream maker and would love to try this! Thank you! Oh Pink, how fun! Gotta try this!! Thank you!